四、使用lighttpd + mod_proxy + Mongrel 实现 Scale , 如果安装Mongrel请看我的前一篇Blog：使用Mongrel替代scgi . Now, we are building where.uuzone.com website, it’s another profile for uuzone to find people and photos. the main line is Where, Who, When and What. it’s still an alpha version site at sandbox.uuzone.com , powered by rubyonrails ,and only work fine on firefox. welcome for your new experience and give me some comments. Now TextMate users can migrate to RADRails even easier after their 30-day Trial period is over. I have gone through most of the Rails commands in TextMate and made equivalent templates in RADRails. If anything it will make it easier for rails developers to move back and forth between the two most popular IDEs. 3.create rails application openid, don’t forget config you database, the generator weill be create user model for users table. It won’t make you coffee, sing songs of sweet regret or sit at your bedside when you’re ill, but it might make life just a tad bit easier for you. An Ajax enabled online calendar. Drag and drop events to change dates, drag the start/end of an event to create multi-day events, create and edit events without refreshing the page, all with an iCal style interface. suited us fine, and made the code a bit shorter. You have to attach a class “rounded” to the divs you want round. While I was building the Blackbird project, it bothered me that the info windows were so big, even if I didn’t have enough text to fill them. TLabel is my answer to that problem. With it, you can label a point on the map and only take up as much map-space as you need. Now I just need to go back and use it on the Blackbird page. 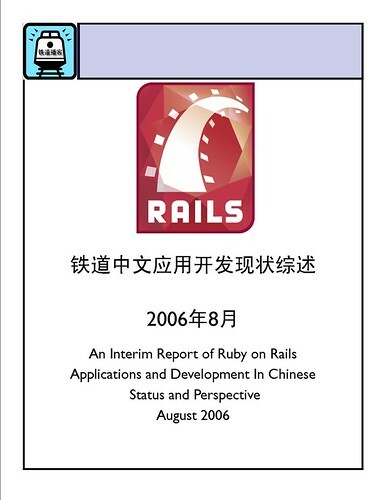 Rails可以通过选择不同的log lever来控制log文件的输出，可以使用的log lever有:debug, :info, :warn, :error, :fatal. :debug level提供最详细的log, 可以将每一条sql都记录下来。:info level是production环境下的默认设置，不会写出sql的执行情况，但也会很详细，如果是ActiveMailer，它会记录下每封信的内容，Log文件内容就是快速增长。为了避免Log把空间塞满的情况发生，要注意定期清除Log，另外是选择:warn level等log level, 只记录重要的信息. off the URL, however it does not seem to pick up the URL parameters. It’s so cool , i like this because it’s most like office word. I'm Jesse Cai, my chinese name is 蔡望勤 (Cai Wang Qin). 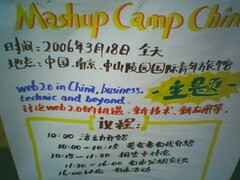 My blog site is http://www.caiwangqin.com/. I update it everyday about events in my life. If you find any article interesting, just post your comments there. Your comment is displayed on my home page. I can get notification via email about your post. So I won't miss your comment. Please send me an email before you add me to your contact. Otherwise, I may have to ignore you. I don't enjoy chatting on business time.